The children’s books series ‘Special Powers’- Self-coaching for Kids comprises original, positive and coaching stories with a lot of humor. 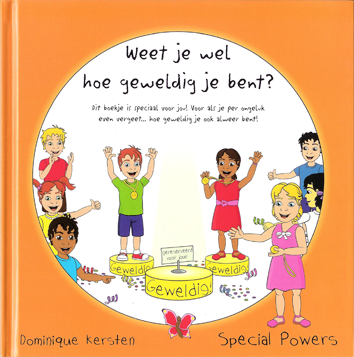 With these books, kids can practice their ‘Special Powers’ (my collective term for life-skills such as: standing firm, having self-confidence, dealing with different emotions and feelings, being able to make choices, daring, etc.) The first two stories have been published in the Dutch language, and many more will follow (at least 10 more titles are being prepared). The English version of the books will be available as E books shortly. The books are about situations every child encounters, directly or indirectly. They are not labelling your child. ‘Self-coaching’ means children and parents can use the books at home, to learn to help themselves and each other. The original way the different subjects are addressed, sparks conversations and invites the readers to ask each other questions. This can lead to surprising insights ;-)! The books are suitable for children aged approx. 5 to 10 and (grand)parents, aunts, uncles, teachers and friends of all ages. ‘Weet je wel hoe geweldig je bent?’ (‘Do you even know how wonderful you are?) deals with self-confidence and …insecurities. It helps you remember how wonderful you are and why! Of course that’s always a nice thing to remember, but it’s especially handy at times you accidentally lost your self-confidence a bit… (happens to the best of us). With the aid of this book, you’ll have it back in no time and you’ll be able to write down/draw stuff to help yourself remember next time around! In the back of the book, you can add pictures, write or draw things and answer questions. All kinds of reminders you can help yourself with. And…. if you wonderfulness doesn’t fit into this book (something I can imagine! ), get an extra piece of paper, or clay, or write a song about how wonderful you are. Anyhing goes :-)! An important aspect of the book is, the fact you don’t first have to have learned, accomplished, dared, changed, won or finished something to be wonderful. You already are wonderful! Exactly the way you are at this very moment! And if you feel wonderful, everything will go much smoother…. To order this book, click here to go to the ‘Special Powers’ Web Shop! 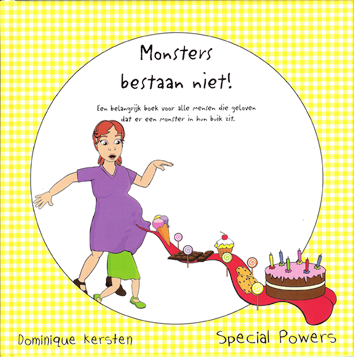 ‘Monsters bestaan niet!’ (Monsters don’t exist!’) is about diets and control. Something quite peculiar is going on! It’s as if some adults suddenly….believe in monsters all over again! Kato’s mum for example, has a monster in her tummy! A munch-monster! That’s what she says… She must go on a diet to beat the munch-monster. But, what you can’t have… usually looks even more appetizing and amazing than it really is! And something you fear… usually looks way bigger, scarier and more real than it actually is. If you have decided it leads a life of it’s own (like the munch-monster in the story), can boss you around ánd is hard to beat… you’ll have a hard time beating it! Instead of fighting yourself, I have a better idea: befriend yourself! Understand and feel how your body works, what it needs and… that it’s actually you! That way you’ll feel when you’re hungry or thirsty, what you need and when you’ve had enough (because you’re body will tell you to ‘stop!’) Clever and much nicer!